Your office layout can even reflect your corporate culture and mission. Good-looking and cozy layout can increase staff's work efficiency. You should tailor your office design to complement the type of atmosphere you want to achieve. Here are some good ideas and tips for desired office layout. Most importantly, create an environment that focuses on openness, collaboration, visibility, and communication. To do so, consider the following factors. Leave enough space. Calculate the space before arranging office equipment. Avoid too crowded office layout which will make people feel bad and then hinder people's imagination and creativity. For example, The paths within for movement must be cleared and wide enough. Ask your employees about their opinions. This will give some more ideas to rethink. Ask your employees about the layout because they are people who would spend more time in the office. Choose the furniture that suits the space well. The shape of the furniture must be according to the space provided by the office. The good placement of the furniture would give a professional look and would give better sitting arrangements for the employees. The L-Shaped furniture is the best furniture because it utilizes more space and provides more sitting arrangements for the employees. It fits the corner of the room in better way. The use of cabinets would organize your office and nothing would be placed unorganized and it would allow everyone to find the things placed in the cabinets easily. Consider to use moveable desks and chairs. Desks on wheels: something so simple can transform a team environment. Embraced by business accelerators and start-ups alike, the mobile desk means working with whomever you want, whenever you want and at any suitable location. Another important factor is lighting effect. Dark environment is bad for health especially eyes and may decrease efficiency. Provide enough lights in the room. Preview the office layout in software to improve it before you really furnish it. Some pieces may not work out as well as you imagine. For example, the color may not coordinate and the space may not be large enough. You can avoid these problems by using office layout software to draw a detailed office layout plan. You start with adding pre-drawn office furniture symbols into your office floor plan to modify your office layout ideas live so you can see how the furniture will look in your space. Shapes are dynamically scaled. In just a few steps you can go from an office layout idea to seeing a virtual tour of your space. We bring our years of design expertise to the table to help you create your desired office layout. 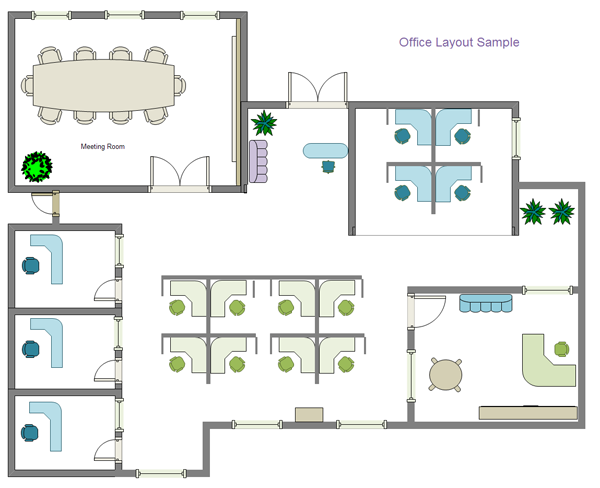 Click here to free download Office Layout Software. Then you can use the built-in office layout symbols and templates to present your office layout in minutes.